I feel like I haven’t done a pasta post in a while, which for me is rather odd. Baking has taken over a bit lately and I guess it’s because my nights have been rather busy. Sunday is usually my free day which also happens to be baking day. Baking is actually going to have to take a back seat for now (I say this but I bet you next week I’ll have another baking post), as since this blog the kilos are creeping up on me (not that pasta is helping the issue). I'm pretty good when it comes to controlling my urges for sugar - I keep a limited amount in my house. When I make a cake or cupcakes or anything sweet I tend to keep a piece or two for myself, then hand the rest out to my family. I guess I get more pleasure out of others enjoying my creations than I do, not that I don't enjoy eating! I've recently sat down and wrote a list of dishes that I am keen to make, like pork belly and duck, two things I've never cooked. Dishes like this make me nervous as one of my biggest hates is to cook a meal for someone and it not taste great - a little insight to my need for perfection. I like to do a test first to make sure I like it before I cook it for others. Anyway, this pasta dish would have to be, beside traditional carbonara, the only other creamy pasta I love. I make this dish fairly often because my other half loves it, and it’s great for left over’s. I might have mentioned before that I have a bit of a love affair with pancetta, and mixed with mint and peas just seem to be a match made in heaven. I grabbed this recipe off Jamies site (here) about a year ago, and it didn’t take long for me to make it. I try to use fresh herbs where ever possible, but sometimes I just don't have the time or energy to go to the shops and buy them. In this dish, I use dried mint flakes and it works just as well. If this is the case for you, just add as you go til there's the right balance of flavours. It’s a very simple dish to make, so give it a go because I’m sure you’ll love it. Bring a pot of salted water to boil, then add the farfalle and cooking as per packet instructions. 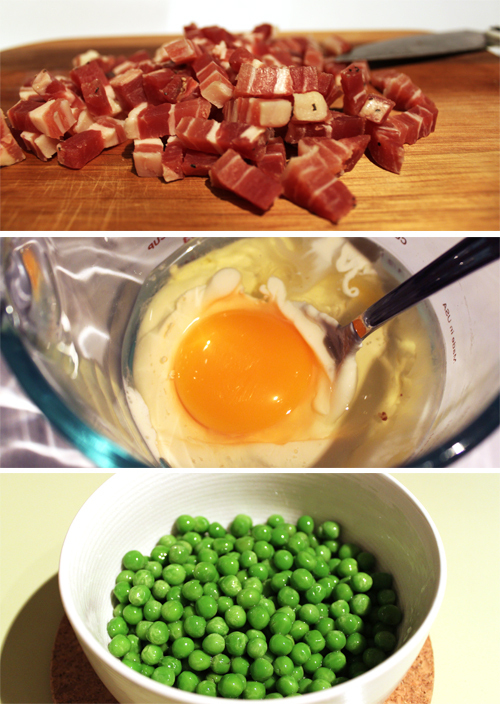 In a small pot, cook the pancetta until golden and crispy. When done, turn off the heat and set aside. In small bowl, whisk together the egg, cream, salt and pepper. 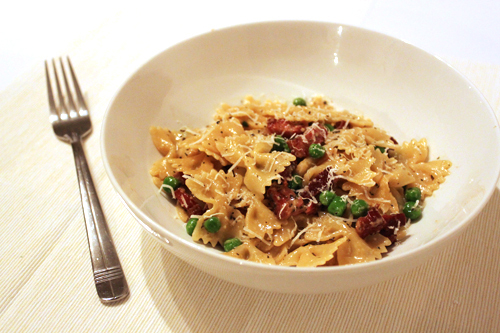 When the farfalle is nearly cooked, add the peas and stir – these will only take a minute. When the pasta is al dente, drain and add to the pot of pancetta. Add the cream slowly and stir as you go – this will ensure the egg mixture doesn’t cook too fast and scramble. Then fold though the mint and parmesan. Serve immdiately topped with a little extra parmesan.